The blue whale is not only the largest animal on Earth right now, but could very well be the largest animal ever. When these massive animals die, they don’t always sink. Sometimes they wash up on shore and it goes without saying that getting rid of the carcass is no small task. When a whale dies and begins to decompose, any food left in the gut begins to rot and bacteria inside the animal proliferate. The bacteria produce heat and gasses which build up and cause the animal to swell up like a gigantic dead meat balloon. Eventually, the pressure becomes too great and the animal can actually explode. Areas that are prone to having dead whales wash ashore have people specifically tasked with puncturing the whale, so the gas/blood/entrails all come flying out in a controlled manner. We actually posted a video of this last fall, which you can check out here. 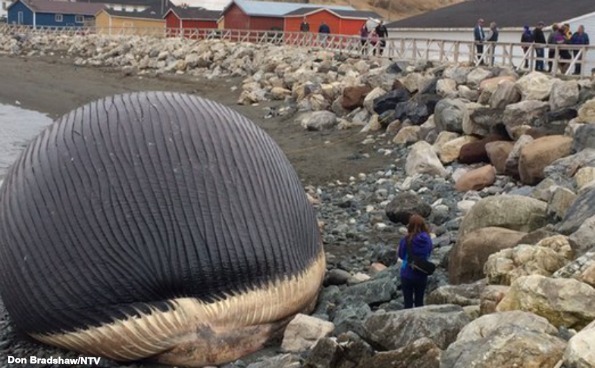 However, sometimes whales wash up in areas where the locals aren’t in a good position to properly dispose of the animal, which is what residents in a small town in Newfoundland are currently facing. When disposing of a whale, there are basically two main options, and neither of them are cheap. First, the whale can be brought back out to sea and dropped down for the scavengers, as long as it isn’t released close enough to possibly wash back up to the beach. This would require a ship large enough to haul such an animal and it also depends on the location, as a large ship will have trouble maneuvering in tight spaces. The other option is to bury the whale, but it takes an extremely large machine to dig a sufficient hole. Again, depending on the location, the machinery might not be able to get into a good position. Trout River is a small town that is home to about 600 residents and one large, uninvited guest: a 25 meter (81 foot) long whale carcass. It is assumed that the animal got caught on the ice and died a few weeks ago, but has just recently come ashore. Images of the whale have recently been released, which has already swollen considerably and is putting Trout River in a difficult position as they seek a solution before the animal explodes. Emily Butler, the Town Manager, has stated that the inflated whale will begin to smell and also noted that they don’t have the resources to properly deal with the situation. Federal officials claim it is the town’s responsibility to deal with it and just let it decompose naturally, but the local government disagrees as allowing the animal to decompose out in the open poses a health risk to beachgoers and could potentially explode, scattering the insides. Whatever happens, let’s hope that this situation is handled better than the whale that washed up in Florence, Oregon in 1970, when officials decided that a large amount of dynamite would blast the whale back into the water and vaporize any remaining bits. Instead, it blasted decaying whale entrails over a 240 m (800 foot) radius. Note: Trout River was incorrectly initially described as a small island. That was a typo, as it is a small town on the island of Newfoundland and isn&apos;t an island in and of itself. Apologies for any confusion that came from that error.